One of the best things about doing prod­uct reviews, is that you get to know about prod­ucts that you would oth­er­wise prob­a­bly never know of…. 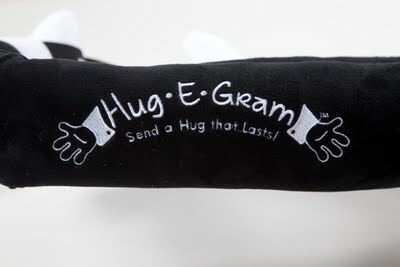 The other day I received some infor­ma­tion about a new prod­uct called Hug-E-Gram. The con­cept caught my atten­tion. The patent pend­ing Hug-E-Gram con­sists of two soft plush cot­ton arms with car­toon hands that are held together by an elas­tic band. They are stuffed with a poly­ester fiber to cre­ate a soft and cud­dly hug giv­ing a heart­warm­ing feel­ing. 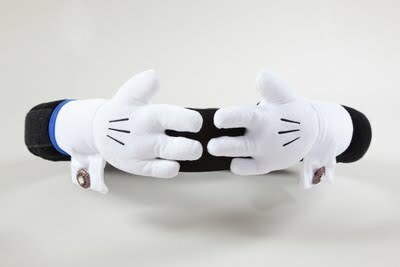 Each arm is 32 inches in length and the Hug-E-Gram is held in place with vel­cro strips so that one size will fit all. It can be sur­face washed and air dried. At first I wasn’t too sure about the prod­uct, I mean who would I send a “hug“ to….Then hubby came to my mind! It seems that he is for­ever work­ing, and run­ning a HUGE Co-Gen plant, he has to be there an awful lot — so we are often apart. He con­tin­u­ally calls and tells me how much he misses me, and wishes he could be at home. This I thought would be a per­fect way to let him know how much I really miss him too! 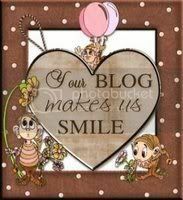 I wrote Peri, the founder of Hug-E-Gram, and asked if she would like to do a review and give­away at Cool­Canucks, which she imme­di­ately agreed to! She is an extremely kind and gen­er­ous lady, not to men­tion bril­liant in invent­ing the Hug-E-Gram!! “My name is Peri and I am a breast can­cer sur­vivor. Even though my fam­ily had a long his­tory of can­cer, I was still shocked when my Doc­tor told me the three worst words in the Eng­lish lan­guage, “You have Can­cer”. I decided to fight back aggres­sively and over the past five years I have had many surg­eries and treat­ments, but I am happy to say I am can­cer free today! Along the way there were many dark days. The pain was excru­ci­at­ing, the men­tal anguish of can­cer recur­ring was unnerv­ing, and just cop­ing day to day was very dif­fi­cult. While peo­ple were very kind and meant well, the most com­fort I felt were the sim­ple hugs from my hus­band. Maybe it was the love, or maybe it was the sup­port, or maybe know­ing we were in this together! What­ever it was, the times I felt the worst were the times I needed a hug the most. In the begin­ning of my treat­ments my hus­band was always there for me, but as the months turned into years, his job made it impos­si­ble for him to be there all the time. How­ever, I sorely missed his hugs when he was away. I thought if he couldn’t be there to give me a hug, maybe I could make some­thing that would be the next best thing to him being there. Not being very good at sewing I still decided to sew a plush, soft set of arms that I could wrap around me. I imag­ined clos­ing my eyes and feel­ing the sup­port and com­fort of a hug from my husband. The hug really worked, I always felt bet­ter, but I didn’t dare tell him about for fear he would think I was being silly. I thought I had kept it secret from him when one day I went to put it on and I noticed a tiny audio speaker with a but­ton hang­ing on a rub­ber band from the hug. I pushed the but­ton and out came my husband’s voice saying,“You are the best, I love you! and I think the hug is a great idea! 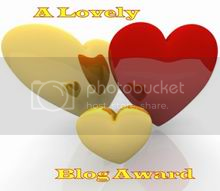 ” I felt goose bumps up and down my spine, and I broke down and started to cry! I wanted to freeze that moment in time and be able to share this feel­ing with other can­cer patients and so the Hug-E-Gram was born. It started me think­ing about the peo­ple I thought would ben­e­fit from a Hug-E-Gram. Moth­ers whose chil­dren are liv­ing away from home and won’t be there to cel­e­brate on Mother’s Day, they need a hug. Or our brave men and women whom are serv­ing over­seas and won’t be home for the hol­i­days, they need a hug. Or the grand­par­ents liv­ing miles away from their grand­chil­dren and not being able to afford the trip, they need a hug. I real­ized that hugs were the med­i­cine for the soul and every­body needs one! Though we are often so many miles apart I felt Hug-E-Gram could bring peo­ple closer together. What an extremely great idea by Peri! I totally love it! I was sent one to review, and it works just like it says it does, it is beyond wonderful!! They give you the option to record a short voice message…I knew I had to send my hubby one of these hugs! The record­ing process is extremely easy and once that step was com­pleted, I received the box with the con­tain­ing the Hug-E-Gram for Marc, a wrist band where you read “ I LOVE you”, and a gor­geous bou­quet of hand­crafted roses! The mes­sage in the record­ing is really clear, and I can’t tell you how happy I am to be able to give this to hubby! If you have a friend, a rel­a­tive, some­one spe­cial that is hav­ing a rough time or you just want to let them know you love them or miss them, Hug-E-Gram is really a great way to let them know you care!! The very kind and extremely gen­er­ous Peri would love to give one lucky Cool­Canucks reader the chance to win a Hug-E-Gram of their very own!! 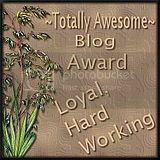 Yaye, you will be so impressed with the Hug-E-Gram and may want to even order one before even enter­ing the give­away!! They are that amazing!! 1) Head on over to Hug-E-Gram and tell me in a com­ment who you would send a Hug-E-Gram to! Fol­low @coolcanucks and @HugEGram on Twit­ter! Leave me your twit­ter name! Become a Face­book Fan of Hug-E-Gram! Leave me your Face­book name please. Pur­chase any­thing from Hug-E-Gram for the dura­tion of the give­away and get 10 extra entries!! Just tell me in a comment! A HUGE thank you to Hug-E-Gram for spon­sor­ing us with this GREAT Con­test here at CoolCanucks!! I really love the idea of this HUG. 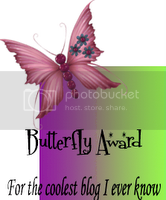 I would love to send one to my best friend Adri­enne. She is the most car­ing abd lov­ing per­son that I have ever met and would just love for her to know what a bless­ing she is to so many oth­ers and that she really deserves a big HUG. 1. I would send one to my aunt. I dont get to see her a lot. I would send a Hug-E-Gram to my daugh­ter … she LOVES hugs!!! I am a fol­lower of both on twitter! I would send this to my sis­ter!! I would send one to my mom when I leave for school. I sub­scribe and fol­low, and I would send this to a friend out of state. I sub­scribe, fol­low and I’d send this to my mom.